Kiev (/ˈkiːɛf, -ɛv/) or Kyiv (Ukrainian: Київ [ˈkɪjiu̯] ( listen); Russian: Киев [ˈkʲiɪf]) is the capital and largest city of Ukraine, located in the north central part of the country on the Dnieper River. The population in July 2013 was 7006284720000000000♠2,847,200 (though higher estimated numbers have been cited in the press), making Kiev the 8th largest city in Europe. The city prospered again during the Russian Empire's Industrial Revolution in the late 19th century. In 1917, after the Ukrainian National Republic declared independence from the Russian Empire, Kiev became its capital. From 1919 Kiev was an important center of the Armed Forces of South Russia and was controlled by the White Army. From 1921 onwards Kiev was a city of the Ukrainian Soviet Socialist Republic, which was proclaimed by the Red Army, and, from 1934, Kiev was its capital. During World War II, the city again suffered significant damage, but quickly recovered in the post-war years, remaining the third largest city of the Soviet Union. Currently, Kiev is the traditional and most commonly used English name for the city, but in 1995 the Ukrainian government adopted Kyiv as the mandatory romanization for use in legislative and official acts. As a prominent city with a long history, its English name was subject to gradual evolution. The early English spelling was derived from Old East Slavic form Kyjev (Cyrillic: Къıєвъ). The name is associated with that of Kyi (Кий), the legendary eponymous founder of the city. Early English sources use various names, including Kiou, Kiow, Kiew, Kiovia. On one of the oldest English maps of the region, Russiae, Moscoviae et Tartariae published by Ortelius (London, 1570) the name of the city is spelled Kiou. On the 1650 map by Guillaume de Beauplan, the name of the city is Kiiow, and the region was named Kÿowia. In the book Travels, by Joseph Marshall (London, 1772), the city is referred to as Kiovia. While the choice of these spellings has likely been influenced by the Polish name of the city (Polish: Kijów) as until the mid-17th century the city was controlled by Poland, the name Kiev that started to take hold at later times, likely originates on the basis of Russian orthography and pronunciation [ˈkʲijɪf], during a time when Kiev was in the Russian Empire (since 1708, a seat of a governorate). In English, Kiev was used in print as early as in 1804 in the John Cary's "New map of Europe, from the latest authorities" in "Cary's new universal atlas" published in London. The English travelogue titled New Russia: Journey from Riga to the Crimea by way of Kiev, by Mary Holderness was published in 1823. By 1883, the Oxford English Dictionary included Kiev in a quotation. Kiev is also based on the old Ukrainian language spelling of the city name and was used by Ukrainians and their ancestors from the time of Kievan Rus until only about the last century. Kyiv ([ˈkɪjiw]) is the romanized version of the name of the city used in modern Ukrainian. Following independence in 1991, the Ukrainian government introduced the national rules for transliteration of geographic names from Ukrainian into English. According to the rules, the Ukrainian Київ transliterates into Kyiv. This has established the use of the spelling Kyiv in all official documents issued by the governmental authorities since October 1995. The spelling is used by the United Nations, all English-speaking foreign diplomatic missions, several international organizations, Encarta encyclopedia, and by some media in Ukraine. In October 2006, the United States federal government changed its official spelling of the city name to Kyiv, upon the recommendation of the US Board of Geographic Names. The British government has also started using Kyiv. The alternate romanizations Kyyiv (BGN/PCGN transliteration) and Kyjiv (scholarly) are also in use in English-language atlases. Most major English-language news sources like the BBC continue to use Kiev. It is believed that Kiev was founded in the late 9th century (some historians have wrongly referred to as 482 AD). The origin of the city is obscured by legends, one of which tells about a founding-family consisting of a Slavic tribe leader Kyi, the eldest, his brothers Shchek and Khoryv, and also their sister Lybid, who founded the city (The Primary Chronicle). According to it the name Kyiv/Kiev means to "belong to Kyi". Some claim to find reference to the city in Ptolemy’s work as the Metropolity (the 2nd century). Another legend states that Saint Andrew passed through the area and where he erected a cross, a church was built. Also since the Middle Ages an image of the Saint Michael represented the city as well as the duchy. There is little historical evidence pertaining to the period when the city was founded. Scattered Slavic settlements existed in the area from the 6th century, but it is unclear whether any of them later developed into the city. 8th-century fortifications were built upon a Slavic settlement apparently abandoned some decades before. It is still unclear whether these fortifications were built by the Slavs or the Khazars. If it was the Slavic peoples then it is also uncertain when Kiev fell under the rule of the Khazar empire or whether the city was, in fact, founded by the Khazars. The Primary Chronicle (a main source of information about the early history of the area) mentions Slavic Kievans telling Askold and Dir that they live without a local ruler and pay a tribute to the Khazars in an event attributed to the 9th century. At least during the 8th and 9th centuries Kiev functioned as an outpost of the Khazar empire. A hill-fortress, called Sambat (Old Turkic for "High Place") was built to defend the area. At some point during the late 9th or early 10th century Kiev fell under the rule of Varangians (see Askold and Dir, and Oleg of Novgorod) and became the nucleus of the Rus' polity. The date given for Oleg's conquest of the town in the Primary Chronicle is 882, but some historians, such as Omeljan Pritsak and Constantine Zuckerman, dispute this and maintain that Khazar rule continued as late as the 920s (documentary evidence exists to support this assertion – see the Kievian Letter and Schechter Letter.) Other historians suggest that the Magyar tribes ruled the city between 840 and 878, before migrating with some Khazar tribes to Hungary. According to these the building of the fortress of Kiev was finished in 840 by the lead of Keő (Keve), Csák and Geréb, the three brothers, possibly members of the Tarján tribe (the three names are mentioned in the Kiev Chronicle as Kyi, Shchek and Khoryv, none of them are Slavic names and it has been always a hard problem to solve their meaning/origin by Russian historians. Their names were put into the Kiev Chronicle in the 12th century and they were identified as old-Russian mythological heroes). During the 8th and 9th centuries, Kiev was an outpost of the Khazar empire. However, being located on the historical trade route from the Varangians to the Greeks and starting in the late 9th century or early 10th century, Kiev was ruled by the Varangian nobility and became the nucleus of the Rus' polity, whose 'Golden Age' (11th to early 12th centuries) has from the 19th century become referred to as Kievan Rus'. In 968, the nomadic Pechenegs attacked and then besieged the city. In 1000 AD the city had a population of 45,000. During 1169, Grand Prince Andrey Bogolyubsky sacked Kiev taking many pieces of religious artwork including the Mother of God icon. In 1203 Kiev was captured and burned by Prince Rurik Rostislavich and his Kipchak allies. In the 1230s the city was besieged and ravaged by different Rus' princes several times. In 1240 the Mongol invasion of Rus' led by Batu Khan completely destroyed Kiev, an event that had a profound effect on the future of the city and the East Slavic civilization. At the time of the Mongol destruction, Kiev was reputed as one of the largest cities in the world, with a population exceeding 100,000 in the beginning of the early 12th century. In the early 1320s, a Lithuanian army led by Gediminas defeated a Slavic army led by Stanislav of Kiev at the Battle on the Irpen' River, and conquered the city. The Tatars, who also claimed Kiev, retaliated in 1324–1325, so while Kiev was ruled by a Lithuanian prince, it had to pay a tribute to the Golden Horde. Finally, as a result of the Battle of Blue Waters in 1362, Kiev and surrounding areas were incorporated into the Grand Duchy of Lithuania by Algirdas, Grand Duke of Lithuania. In 1482, the Crimean Tatars sacked and burned much of Kiev. In 1569 (Union of Lublin), when the Polish–Lithuanian Commonwealth was established, the Lithuanian-controlled lands of the Kiev region, Podolia, Volhynia, and Podlachia, were transferred from the Grand Duchy of Lithuania to the Crown of the Kingdom of Poland, and Kiev became the capital of Kiev Voivodeship. In 1658 (Treaty of Hadiach), Kiev was supposed to become the capital of the Duchy of Rus' within the Polish–Lithuanian–Ruthenian Commonwealth, but the treaty was never ratified to this extent. Kept by the Russian troops since 1654 (Treaty of Pereyaslav), it became a part of the Tsardom of Russia from 1667 on (Truce of Andrusovo) and enjoyed a degree of autonomy. None of the Polish-Russian treaties concerning Kiev have ever been ratified. In the Russian Empire Kiev was a primary Christian centre, attracting pilgrims, and the cradle of many of the empire's most important religious figures, but until the 19th century the city's commercial importance remained marginal. In 1834, the Saint Vladimir University was established; it is now called the Taras Shevchenko National University of Kiev after the Ukrainian poet Taras Shevchenko. Shevchenko was a field researcher and editor for the geography department.The medical faculty of the Saint Vladimir University has been separated into an independent institution during the Soviet period and is called now Bogomolets National Medical University. During the 18th and 19th centuries city life was dominated by the Russian military and ecclesiastical authorities; the Russian Orthodox Church formed a significant part of Kiev's infrastructure and business activity. In the late 1840s, the historian, Mykola Kostomarov (Russian: Nikolay Kostomarov), founded a secret political society, the Brotherhood of Saint Cyril and Methodius, whose members put forward the idea of a federation of free Slavic people with Ukrainians as a distinct and separate group rather than a subordinate part of the Russian nation; the society was quickly suppressed by the authorities. During the Russian industrial revolution in the late 19th century, Kiev became an important trade and transportation centre of the Russian Empire, specialising in sugar and grain export by railway and on the Dnieper river. By 1900, the city had also become a significant industrial centre, having a population of 250,000. Landmarks of that period include the railway infrastructure, the foundation of numerous educational and cultural facilities as well as notable architectural monuments (mostly merchant-oriented). 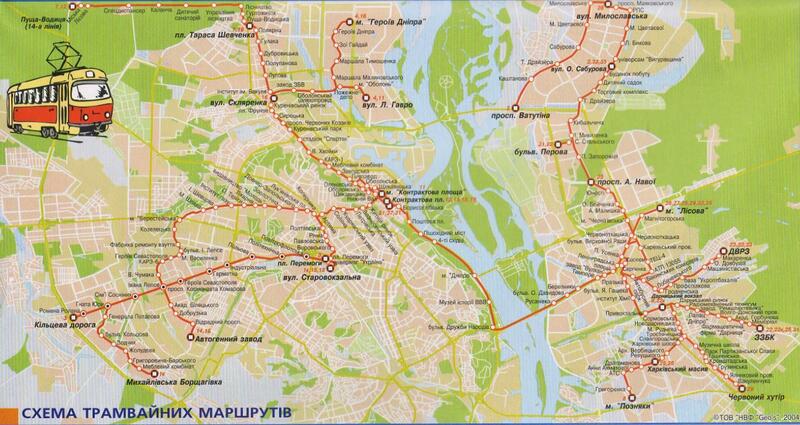 The first electric tram line of the Russian Empire was established in Kiev (arguably, the first in the world). Kiev prospered during the late 19th century Industrial Revolution in the Russian Empire, when it became the third most important city of the Empire and the major centre of commerce of its southwest. In the turbulent period following the 1917 Russian Revolution, Kiev became the capital of several short-lived Ukrainian states and was caught in the middle of several conflicts: World War I, during which it was occupied by German soldiers from 2 March 1918 to November 1918, the Russian Civil War, and the Polish–Soviet War. Kiev changed hands sixteen times from the end of 1918 to August 1920. In 1934 Kiev became the capital of Soviet Ukraine. The city boomed again during the years of the Soviet industrialization as its population grew rapidly and many industrial giants were created, some of which exist to this day. In World War II, the city again suffered significant damage, and was occupied by Nazi Germany from 19 September 1941 to 6 November 1943. More than 600,000 Soviet soldiers were killed or captured in the great encirclement Battle of Kiev in 1941. Most of them never returned alive. Shortly after the city was occupied, a team of NKVD officers that had remained hidden dynamited most of the buildings on the Khreshchatyk, the main street of the city, most of whose buildings were being used by German military and civil authorities; the buildings burned for days and 25,000 people were left homeless. Allegedly in response to the actions of the NKVD, the Germans rounded up all the local Jews they could find, nearly 34,000, and massacred them at Babi Yar over the course of 29–30 September 1941. Kiev recovered economically in the post-war years, becoming once again the third most important city of the Soviet Union. The catastrophic accident at the Chernobyl Nuclear Power Plant in 1986 occurred only 100 km (62 mi) north of the city. However, the prevailing northward winds blew most of the radioactive debris away from the city. In the wake of the collapse of the Soviet Union the Declaration of Independence of Ukraine was proclaimed in the city by the Ukrainian parliament on 24 August 1991. In 2004–2005, the city played host to until then the largest post-Soviet public demonstrations, in support of the Orange Revolution. From November 2013 until February 2014, central Kiev was the primary location of Euromaidan. Geographically, Kiev belongs to the Polesia ecological zone (a part of the European mixed woods). However, the city's unique landscape distinguishes it from the surrounding region. Kiev is located on both sides of the Dnieper River, which flows south through the city towards the Black Sea. The older right-bank (western) part of the city is represented by numerous woody hills, ravines and small rivers. It is a part of the larger Dnieper Upland adjoining the western bank of the Dnieper in its mid-flow. Kiev expanded to the Dnieper's lowland left bank (to the east) only in the 20th century. Significant areas of the left-bank Dnieper valley were artificially sand-deposited, and are protected by dams. Kiev has a humid continental climate (Köppen Dfb). The warmest months are June, July, and August, with mean temperatures of 13.8 to 24.8 °C (56.8 to 76.6 °F). The coldest are December, January, and February, with mean temperatures of −4.6 to −1.1 °C (23.7 to 30.0 °F). The highest ever temperature recorded in the city was 39.4 °C (102.9 °F) on 31 July 1936. The coldest temperature ever recorded in the city was −32.2 °C (−26.0 °F) on 7 & 9 February 1929. Snow cover usually lies from mid-November to the end of March, with the frost-free period lasting 180 days on average, but surpassing 200 days in recent years. Source #2: BBC weather (sun values). Most important buildings of the national government (Cabinet of Ukraine, Verkhovna Rada, others) are located along vulytsia Mykhaila Hrushevskoho (Mykhailo Hrushevsky Street) and vulytsia Instytutska (Institute Street). That portion of the city is also unofficially known as the government quarter (Ukrainian: урядовий квартал). The city also has a great number of buildings for various embassies, ministerial and other important buildings. According to the official registration statistics, there were 7006284720000000000♠2,847,200 residents within the city limits of Kiev in July 2013. According to the All-Ukrainian Census, the population of Kiev in 2001 was 2,611,300. The historic changes in population are shown in the side table. According to the census men accounted for 1,219,000 persons, or 46.7%, and women for 1,393,000 persons, or 53.3%. Comparing the results with the previous census (1989) shows the trend of population ageing which, while prevalent throughout the country, is partly offset in Kiev by the inflow of working age migrants. Some 1,069,700 people had higher or completed secondary education, a significant increase of 21.7% since 1989. In 2005 Kiev hosted the 50th annual Eurovision Song Contest as a result of Ruslana's "Wild Dances" victory in 2004. Numerous songs and paintings were dedicated to the city. Some songs became part of Russian, Ukrainian, and Polish folklore, less known are German and Jewish. The most popular songs are "Without Podil, Kiev is impossible" and "How not to love you, Kiev of mine?". Renowned Ukrainian composer Oleksandr Bilash wrote an operetta called "Legend of Kiev". Other prominent non-football sport clubs in the city include: the Sokil Kiev ice hockey club and BC Kyiv basketball club. Both of these teams play in the highest Ukrainian leagues for their respective sports and whilst BC Kyiv was founded just recently in 1999, Sokil was founded in 1963, during the existence of the Soviet Union. Both these teams play their home games at the Kiev Palace of Sports. Because the city boasts a large and diverse economic base and is not dependent on any single industry and/or company, its unemployment rate has historically been relatively low – only 3.75% over 2005–2008. Indeed, even as the rate of joblessness jumped to 7.1% in 2009, it remained far below the national average of 9.6%. In May 2011 Kiev authorities presented a 15-year development strategy which calls for attracting as much as EUR82 billion of foreign investment by 2025 to modernize the city’s transport and utilities infrastructure and make it more attractive for tourists. There are many libraries in the city with the Vernadsky National Library, which is Ukraine's main academic library and scientific information centre, as well as one of the world's largest national libraries, being the largest and most important one. The National Library is affiliated with the Academy of Sciences in so far as it is a deposit library and thus serves as the academy's archives' store. Interestingly the national library is the world’s foremost repository of Jewish folk music recorded on Edison wax cylinders. Their Collection of Jewish Musical Folklore (1912–1947) was inscribed on UNESCO's Memory of the World Register in 2005. Kiev hosts many universities, the major ones being Kiev National Taras Shevchenko University, the National Technical University "Kiev Polytechnic Institute", and the Kyiv-Mohyla Academy. Of these, the Mohyla Academy is the oldest outright, having been founded as a theological school in 1632, however the Shevchenko University, which was founded in 1834, is the oldest in continuous operation. The total number of institutions of higher education in Kiev currently approaches 200, allowing young people to pursue almost any line of study. While education traditionally remains largely in the hands of the state there are several accredited private institutions in the city. There are about 530 general secondary schools and ca. 680 nursery schools and kindergartens in Kiev. Additionally, there are evening schools for adults, and specialist technical schools. The Kiev funicular was constructed during 1902-1905. It connects the historic Uppertown, and the lower commercial neighborhood of Podil through the steep Volodymyrska Hill overseeing the Dnieper River. The line consists of only two stations. Kiev represents the focal point of Ukraine's "national roads" system, thus linked by road to all cities of the country. European routes , and cross Kiev. Railways are Kiev’s main mode of intracity and suburban transportation. The city has a developed railroad infrastructure including a long-distance passenger station, 6 cargo stations, depots, and repairing facilities. However, this system still fails to meet the demand for passenger service. Particularly, the Kiev Passenger Railway Station is the city's only long-distance passenger terminal (vokzal). Construction is underway for turning the large Darnytsia Railway Station on the left-bank part of Kiev into a long-distance passenger hub, which may ease traffic at the central station. Bridges over the Dnieper River are another problem restricting the development of city’s railway system. Presently, only one rail bridge out of two is available for intense train traffic. A new combined rail-auto bridge is under construction, as a part of Darnytsia project. ↑ "Kiev". Random House Webster's Unabridged Dictionary. ↑ In 2008, the Oxford English Dictionary included 19 quotations with 'Kiev' and none with any other spelling. This spelling is also given by Britannica and Columbia Encyclopedia. ↑ The form "Къıєвъ" (Kyiev) is used in old Rus chronicles like Lavretian Chronicle (Мстиславъ Къıєвьскъıи, Mstislav Kyievski; Къıӕне, Kyiene (Kievans)), Novgorod Chronicles and others. ↑ Lua error in Module:Citation/CS1/Identifiers at line 47: attempt to index field 'wikibase' (a nil value). Originally published: London, J. Almon, 1773, LCCN 03-5435. ↑ Kyiv Post, the leading English language publication in Ukraine. ↑ Rabinovich GA From the history of urban settlements in the eastern Slavs. In the book. : History, culture, folklore and ethnography of the Slavic peoples. M. 1968. 134. ↑ Janet Martin, Medieval Russia:980-1584, (Cambridge University Press, 1996), 100. ↑ Т.Г. Таирова-Яковлева, Иван Выговский // Единорогъ. Материалы по военной истории Восточной Европы эпохи Средних веков и Раннего Нового времени, вып.1, М., 2009: Под влиянием польской общественности и сильного диктата Ватикана сейм в мае 1659 г. принял Гадячский договор в более чем урезанном виде. Идея Княжества Руського вообще была уничтожена, равно как и положение о сохранении союза с Москвой. Отменялась и ликвидация унии, равно как и целый ряд других позитивных статей. ↑ Eugeniusz Romer, O wschodniej granicy Polski z przed 1772 r., w: Księga Pamiątkowa ku czci Oswalda Balzera, t. II, Lwów 1925, s. .
↑ Orlando Figes The Whisperers: Private Life in Stalin's Russia, 2007, ISBN 0805074619 , pages 227–315. ↑ Robert Gellately, Lenin, Stalin, and Hitler: The Age of Social Catastrophe (Knopf, 2007: ISBN 1-4000-4005-1), 720 pages. ↑ Daniel Goldhagen, Hitler's Willing Executioners (p. 290) – "2.8 million young, healthy Soviet POWs" killed by the Germans, "mainly by starvation... in less than eight months" of 1941–42, before "the decimation of Soviet POWs... was stopped" and the Germans "began to use them as laborers". ↑ Andy Dougan, Dynamo: Triumph and Tragedy in Nazi-Occupied Kiev (Globe Pequot, 2004: ISBN 1-59228-467-1), p. 83. ↑ Samuel W. Mitcham, The Rise of the Wehrmacht: The German Armed Forces and World War II, Vol. 1 (ABC-CLIO, 2008: ISBN 0-275-99659-X), p. 539. ↑ Workpermit.com. Retrieved 30 July 2006. ↑ Kiev.info. Retrieved 20 June 2006. ↑ See also: NASU official website[dead link]. Retrieved 28 July 2006. ↑ See also:Kiev University official website. Retrieved 28 July 2006. ↑ See also: KPI official website. Retrieved 28 July 2006. ↑ See also: Kyiv-Mohyla Academy official website[dead link]. Retrieved 28 July 2006. ↑ (Russian) Archunion.com.ua. Retrieved 20 June 2006. Crimea is the subject of a territorial dispute between Ukraine (Autonomous Republic of Crimea) and Russia (Republic of Crimea). This page was last modified on 10 January 2016, at 00:12.